Information flows through Twitter in dynamic, interconnected ways. That complexity has brought about, from historians, tools to try to capture this stream, and from journalists, tools to try to distill it. A new tool does both. The most popular other terms which appear in those tweets. It tells you the quantity of all those results, as well, and graphs them. 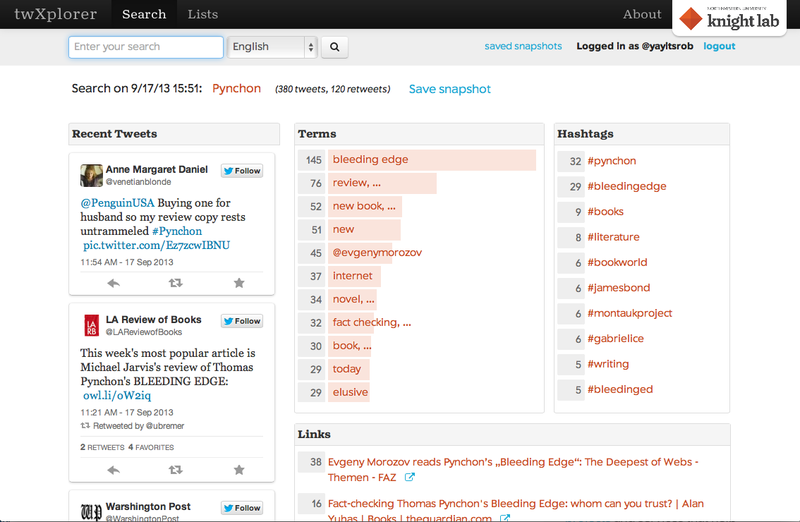 It also lets you save “snapshots” of its dashboard for a search term. In sum, twXplorer lets you save cross-sections of Twitter, frozen in time. And, notably, twXplorer also lets you view your Twitter lists in the same way — to see the most popular terms, tweets, hashtags, and links that appear in them. Twitter lists make up a great deal of my news reading regime, and this kind of auto-summary only makes them more powerful. It could be powerful, too, to make large, comprehensive Twitter lists, and let twXplorer capture and distill that large swath. Combine twXplorer with cleverly-constructed Twitter lists, and you could control your own little battalion of news-finding bots. Disclosure: When I attended Northwestern, I almost did work for Knight Lab. But I didn’t.